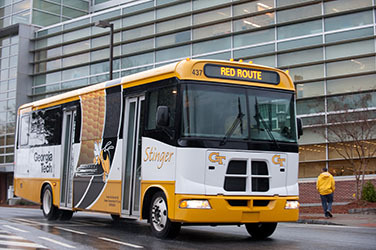 Parking & Transportation Services allows Georgia Tech student organizations, departments, alumni, and community affiliates to charter buses for transportation throughout the metro Atlanta area. To help PTS better understand your organization's needs, please fill out the Stinger/Trolley Rental request form. Reservations must be made at least one week in advance. A cost estimate will be provided upon confirmation of your reservation. Boarding fees or IDs are not required to use the transit system, except where indicated. 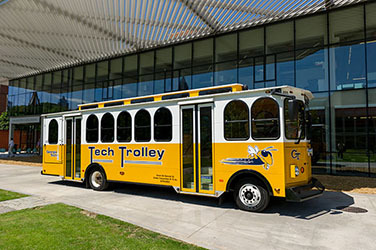 All Georgia Tech buses comply with the Americans with Disabilities Act, and are lift equipped with drivers who are trained in the lifts' use. All estimates include a $50 cleaning/damage deposit that applies against any damage to a bus or trolley caused by a group member or if the bus or trolley requires cleaning beyond what is deemed normal. All services comply with the Americans with Disabilities Act (ADA). Groups are required to identify two individuals per bus who will be responsible for ensuring the safety of the group. The names and contact information of these individuals must be provided after service is approved and prior to the service date. Georgia Tech operators are not responsible for the care of those who may be chemically impaired. Students who, in the judgment of the group's representatives, pose a threat to their own safety or the safety of others will not be allowed to board the bus. Groups who fail to behave responsibly may have their charter privileges revoked or suspended. Approval usually takes three to five days. You will receive notification from our department by email of your approval or denial. For weekend services, no split schedules are allowed; all hours for services are billed. Services will be billed separately at three (3) hour minimum. 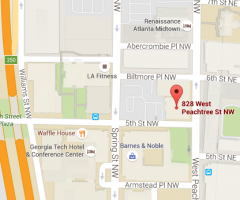 The Stinger and Trolley will travel up to a 50 mile radius from the PTS office (828 W. Peachtree Street NW, Atlanta, GA 30332-0441). Cancellations and modifications are allowed up to 72 hours prior to time of service and must be submitted via email. All cancellations or modifications requested after this time will be subject to a fee penalty equal to the minimum usage fee. During the academic school year, rentals are not provided Monday thru Friday between the hours of 8:00 a.m. and 5:00 p.m. (some exceptions may apply). Based on charter destinations, PTS reserves the right to determine whether standing passengers will be allowed; however, standing will not be allowed on a bus traveling on a 55 miles per hour or higher highways. There is no eating or drinking alcoholic beverages on units. If a person with a disability requires a modification to this policy related to his or her disability, the scheduling group should notify the department's special event coordinator before the service date in order to ensure accommodation.